Expect a line. Its there for a reason. Since we just got done discussing dining with Mark at Yankee Stadium, it seemed like a good idea to select as the subject of the next review a very inexpensive joint. It is really hard to argue with Mamoun’s, and it already has a huge cult following so it scarcely needs any endorsement from me. Why? They make a perfectly delightful falafel (not especially great, but better than many) for a terrific price. 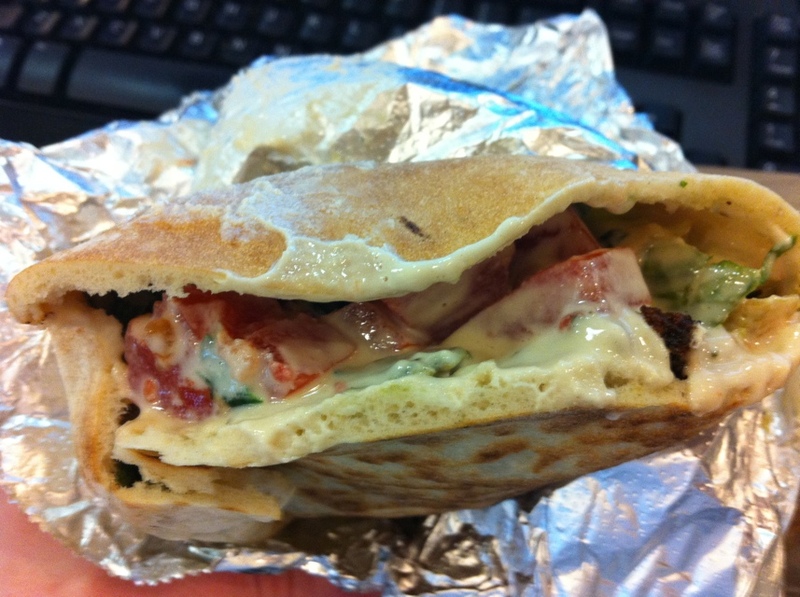 The result is very solid bang for the buck: it’s just $2.50 for a falafel sandwich. The cramped interior. Expect jostling. You get a number of crunchy falafel balls, a spritz of tahini, plenty of lettuce and some tomatoes. The falafel has a very faint peppery spiciness that brings in the lowest of low sizzles to the tongue. But if, as Hugh says, money has an aftertaste, then savings has a taste, and you get it with each bite of Mamoun’s falafel. 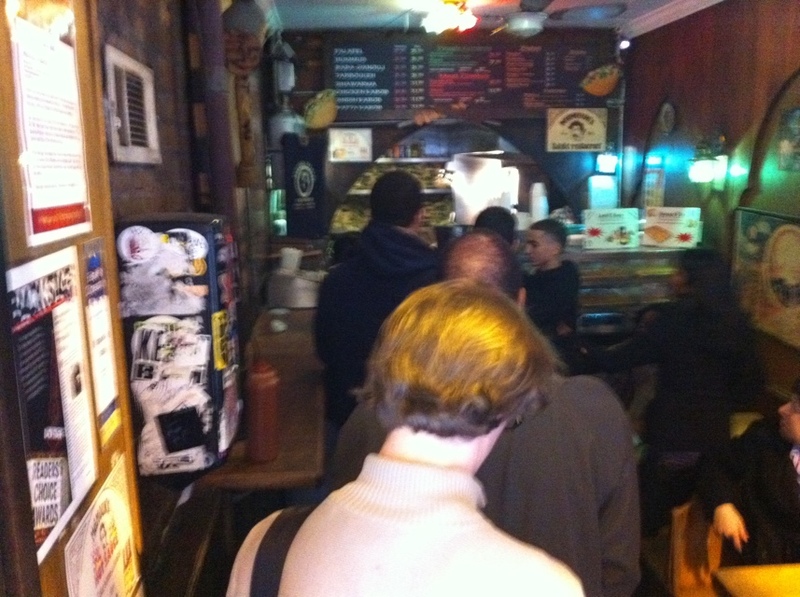 Considering that a slice of pizza is probably much less healthy, and likely much less tasty, Mamoun’s is a solid deal. The falafel itself. Somewhat sloppy, plenty tasty. Look, Mamoun’s is no Taim, which serves up extremely choice falafel. Taim’s are almost dainty and delicate. 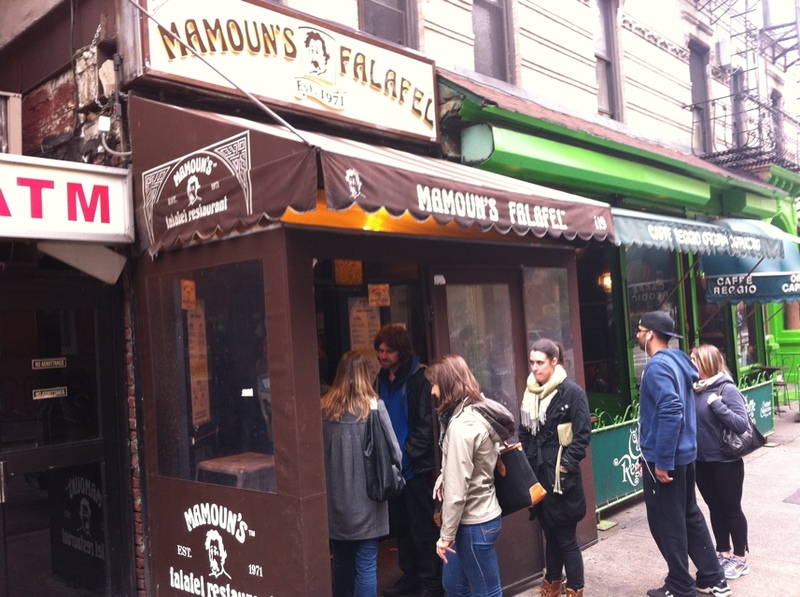 Mamoun’s is rugged, workmanlike and simple. They seem to me to be hitting right in the falafel wheelhouse at a very inexpensive price. They ask just one more thing from you: willingness to wait on a line and not being rattled as people brush past you getting in and out of the cramped space. Plenty of lettuce resting atop mushed falafel below. 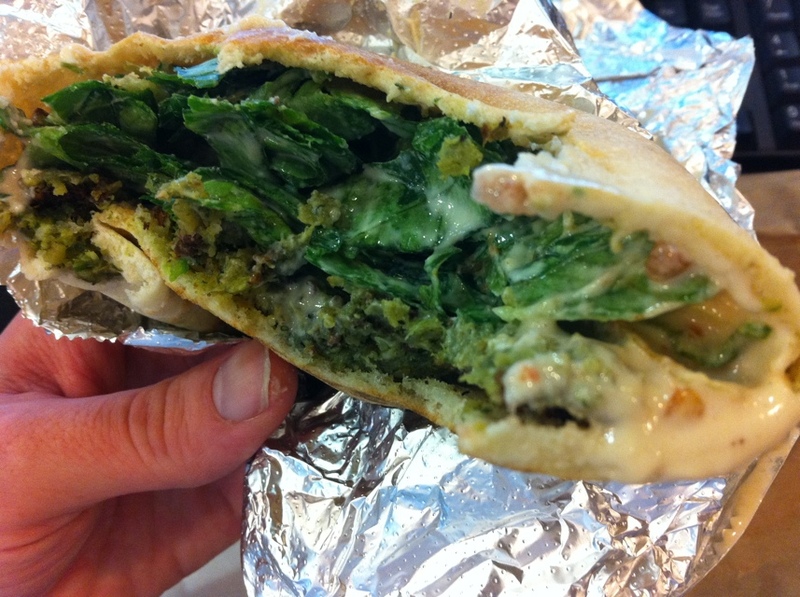 I’d like to say that Mamoun’s is fantastic falafel. I can’t say that, exactly. It is, however, perfectly priced, and it is perfectly suitable. All in all it’s a big win and I am eager to return for their shawarma, which is about $5. Maybe they’ll knock that out of the park, like they do at Bereket.